Are you fed up with breaking your head on how to get all statistics of your website and campaigns in a readable dashboard? Do you dream of a dashboard that only shows the KPI's you and your managers are interested in? Our experts help to build the dashboard so that you can make the right decisions. Would you fly a plane without a proper dashboard ? Over the years, the amount of data that we need to take into account to analyse the performance of a website has exploded. It has become really difficult to have a full overview of the information that help you make the right strategic decisions. On top of that comes the fact that each business has its own characteristics, strategy and of course its own performance indicators. 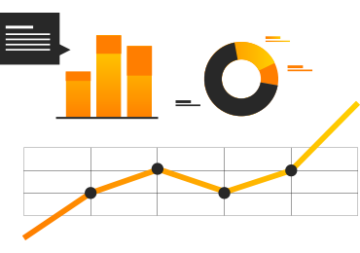 Google Analytics is a great tool to follow up on your website statistics and on the performance of your marketing campaigns. A lot of data is in there but it is easy to get lost, going from report to report without getting the essential information. Our experts discuss with you which data is useful for your business. Then we will create dashboards according to your needs, either directly in Google Analytics, in third-party reporting tools like Dashthis or Klipfolio or, for customised solutions, by using the APIs of Google analytics, Adwords and other marketing channels to combine their data with your internal data. Where useful we will also set up import of additional data into Google Analytics or help you to export data from Google Analytics and other sources into your internal tools. Automated emails with updated reports.